EPHRAIM ISAAC, Ph.D. D.H.L, D. Litt. Interview with Ephraim Isaac on the importance of the Institute of Semitic Studies. Interview with Frank Cross on the importance of the Institute of Semitic Studies. Interview with David Freeman on the importance of the Institute of Semitic Studies. Interview with Anne Kilmer on the importance of the Institute of Semitic Studies. Interview with Robert Hetzron on the importance of the Institute of Semitic Studies. 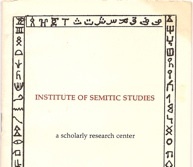 Interview with James Charlesworth on the importance of the Institute of Semitic Studies. Chanting in Amharic and Hebrew of Isaiah 57-58.